To the average World War I American, newspapers were the Twitter, Tumblr, Instagram, and Buzzfeed of Americans today. Newspapers offered a way for people to access, escape, and later remember the events of the war. There are, of course, still newspapers in circulation today, but we don’t depend on them to stay connected and up to date in the same way Americans in the 20th Century did. 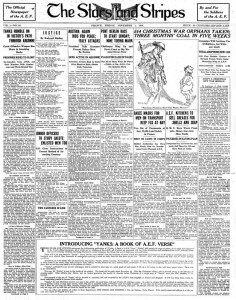 For the average American reader during the WWI era, newspapers were the best and most reliable option for up to date information. And, although nothing was completely safe from factual error and they didn’t have much choice in terms of how they got their news, many people saw their newspapers as being the most trustworthy way to stay informed. Other options for news were few and far between but could include the likes of newsreels, word of mouth, and letters from loved ones (once America joined the war.) However, newsreels did tend to focus less on the news aspect of day to day life and erred toward entertainment rather than serious reporting in the 20th century. Although on a few occasions British newsreels during the pre-war era did show the christening of a few of their ships that would see combat, it wasn’t an avenue for journalism and reporting yet. The roll that newsreels did play seemed was as a popular way to disperse propaganda. This often left the newspapers reigning supreme as the best and most reliable source for news on the happenings of the world, war, and war effort. Another aspect of print journalism at the time that gave newspapers and their editors an edge was the fact that papers had the advantage of being some of the first to get ‘hot off the press’ type news. Other sources either weren’t available yet or took longer to reach people. For example, waiting for word of mouth to circulate was both tedious and likely inaccurate, and waiting on mail could be slow; thus, newspapers were most frequent – producing at least one edition a day. Many newspapers however also had both a morning and evening edition, meaning those who had papers delivered or bought both editions were able to get a double dose of news for the day. 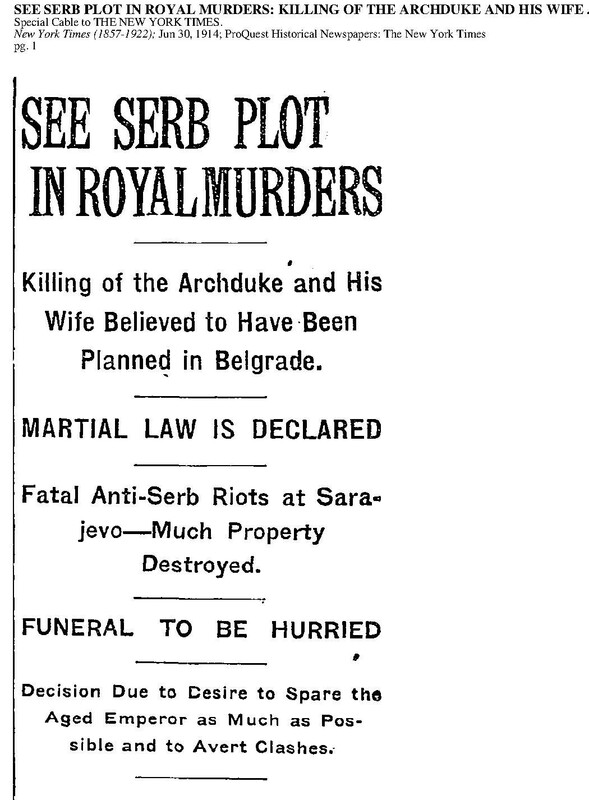 When headlines like those below came rolling in, they would likely hear some additional news later in the day rather than have to wait until the next morning. And, as much as the war seemed to take over the papers, they didn’t stop producing other content, either. Even with the war going on, even the most seemingly mundane topics made their way into the papers. 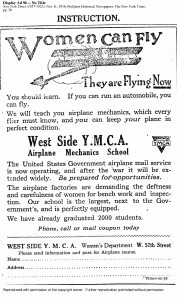 Like the Kaiser’s horoscope and the YMCA ad encouraging women to learn how to fly, there were articles on a discussion of daylight savings time, using more of the metric system in our dealings with countries abroad, and ads discussing the latest ball. I found it to be quite easy to get swept up in the idea that war was all the newspapers talked about, but really, there were plenty of articles that discussed topics that were completely normal, and these likely offered people a reprieve from all the war-centric news. And, for those who are curious, a copy of a paper like the New York Times (where these headlines came from) would have cost buyer two cents per issue. After doing a little math to account for inflation, two cents in 1914 would equal 48 cents in 2015 whereas at the end of the war in 1918, two cents would equal 32 cents by today’s rates. There were also roughly at least 72 (73 including the NYT) different papers being published in the 20th century*. Besides my own rough estimate, there wasn’t a concrete guess at how many papers were in publication and circulation in the 20th Century. Many of those 72 papers were small town type papers as well. 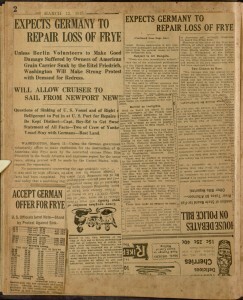 The Stars Stripes Soldiers Newspaper- First edition. Even after the war had ended in 1918 newspapers would still find a way to play a part. They found a like home in the scrapbooks of soldiers and nurses who had been abroad and of citizens who had stayed home. Although each scrapbook and its memories are individual and special to the person who made it, the one item that regularly seems to appear universally at least once in these scrapbooks is newspaper clippings. I have emphasized headlines as my pictorial evidence in this article for the sake of space and physical article length. But in a scrapbook, clippings could range many different topics and have many shapes and sizes. Take these images below for example. 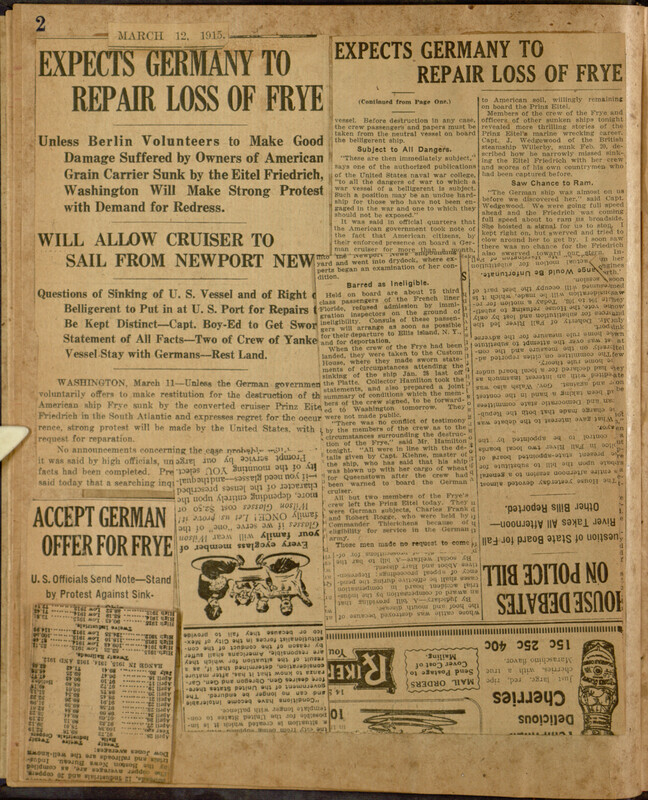 One is long enough to hang off the page and discusses naval intrigue while the other is neatly folded up and mentions the loss of the Frye for the Germans along with other topics. 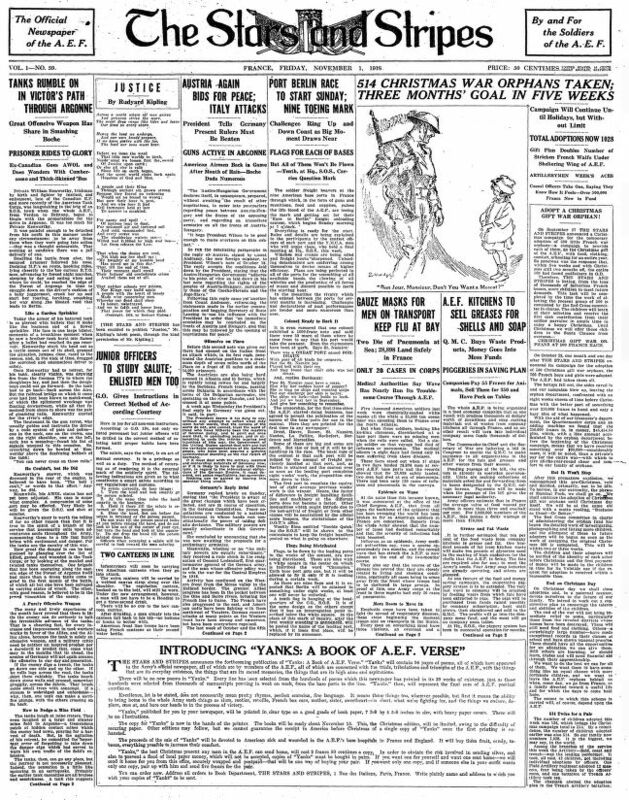 Newspapers offered a multifaceted approach to World War I for those who read them. Newspapers played a vital role in allowing people to commemorate important events during the war, both broadly and personally. Helping to illustrate and pinpoint events both big and small with tangible evidence, allowed people to give context to personal letters along with other important life events that might have sat side by side in the same scrapbook. And although the idea of scrapbooking and commemorating life stories in this way wasn’t new, newspapers were able to serve a number of purposes throughout the war (and after) in allowing people to relate to, escape from, and then remember the war on their own terms and in their own way. 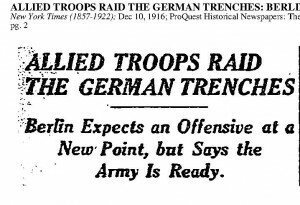 New York Times, “ALLIED TROOPS RAID THE GERMAN TRENCHES,” New York Times, December 10, 1916. New York Times,” Display Ad 96,” New York Times, November 11, 1918. New York Times, “Stars Against Kaiser: Printed in 1911 Predicted Ruin,” New York Times, August 6, 1914. Readex, “America’s Historical Newspapers,”America’s Historical Newspapers. Accessed November 17, 2015. Nelson, Robert L. “Soldier Newspapers, in: 1914-1918-online,” International Encyclopedia of the First World War, ed. by Ute Daniel, Peter Gatrell, Oliver Janz, Heather Jones, Jennifer Keene, Alan Kramer, and Bill Nasson, issued by Freie Universität Berlin, Berlin 2014-10-08. DOI: http://dx.doi.org/10.15463/ie1418.10170. The Guardian, “How the newspapers covered the outbreak of the first world war,” The Guardian, August 4, 2014, http://www.theguardian.com/world/2014/aug/04/firstworldwar-national-newspapers. Selina Williams, “100 Legacies: The Lasting Impact of World War I,” Wall Street Journal, November 18 2015, http://online.wsj.com/ww1/newsreels. New York Times, “Stars Against Kaiser: Printed in 1911 Predicted Ruin,” The New York Times, August 6, 1914. Inflation Calculator, November 17, 2015, http://www.usinflationcalculator.com/. Readex, “America’s Historical Newspapers,”America’s Historical Newspapers, November 17, 2015, http://infoweb.newsbank.com.ezp1.villanova.edu/iw-search/we/HistArchive?p_product=EANX&p_action=timeframes&p_theme=ahnp&p_nbid=T69R62RWMTQ0Nzg2OTE3NC4zNTY3MjM6MToxMToxNTMuMTA0LjYuNA&p_clear_search=yes&d_refprod=EANX&. Library of Congress, “Stars and Stripes: The American Soldiers’ Newspaper of World War I, 1918-1919,” Linbrary of Congress, November 16 2015, http://www.loc.gov/collections/stars-and-stripes/. Unknown, “Newspaper Scrapbook, World War I, 1915-1917,” Falvey Memorial Library Digital Library, September 3, 2014, http://digital.library.villanova.edu/Item/vudl%3A353124. 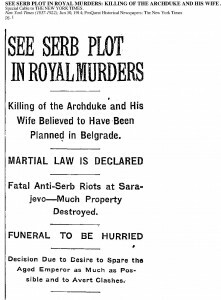 New York Times, “SEE SERB PLOT IN ROYAL MURDERS,” New York Ties, June 30, 1914. 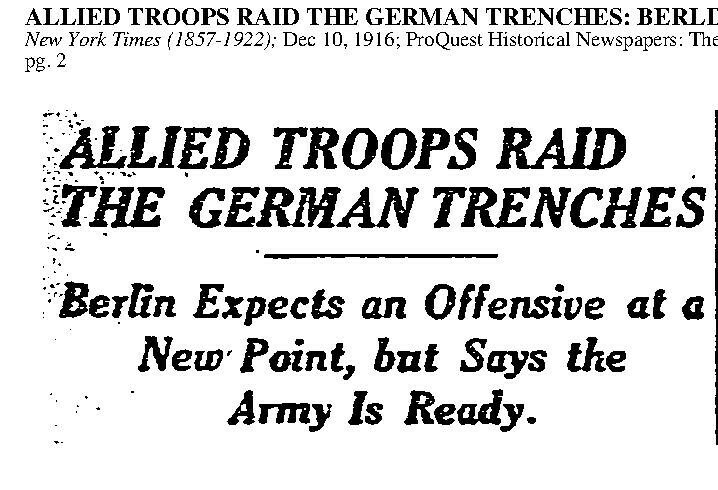 New York Times, “ALLIED TROOPS RAID THE GERMAN TRENCHES,”New York Times, December 10, 1916. 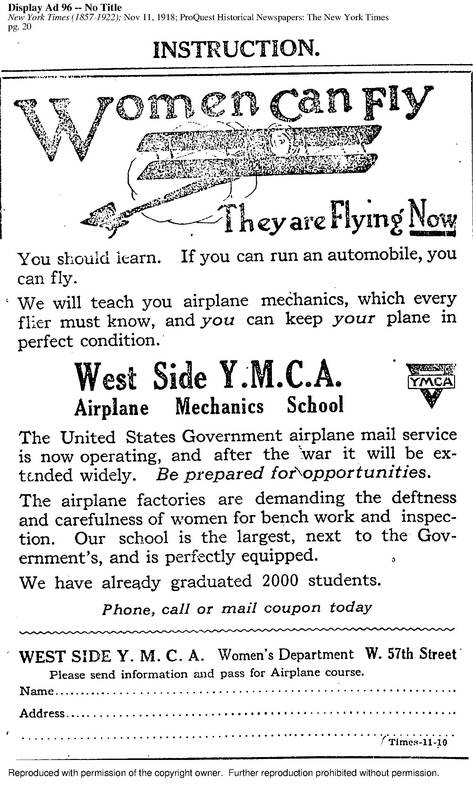 New York Times,”Display Ad 96,” New York Times, November 11, 1918. Robert L Nelson, “Soldier Newspapers, in: 1914-1918-online,” International Encyclopedia of the First World War, September 12, 2015, http://encyclopedia.1914-1918-online.net/article/soldier_newspapers.